Military • Cody Towse, just turned 21, is remembered as brave and charitable. Courtesy image Cody Towse and his mother, Jamie Towse, at his graduation from Army basic training. The 21-year-old soldier was killed in an explosion May 14, 2013, in Afghanistan. 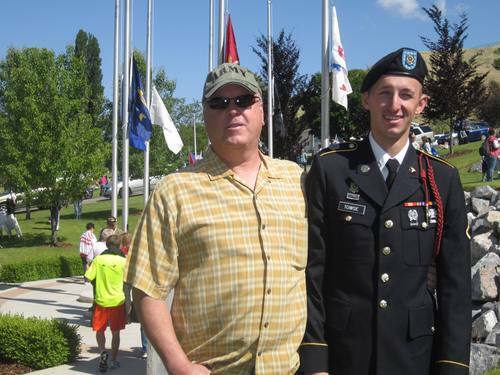 Courtesy image Cody Towse and his father, Jim Towse, at his graduation from basic training. Cody Towse was killed in an explosion May 14, 2013, in Afghanistan. Courtesy image Army Pfc. 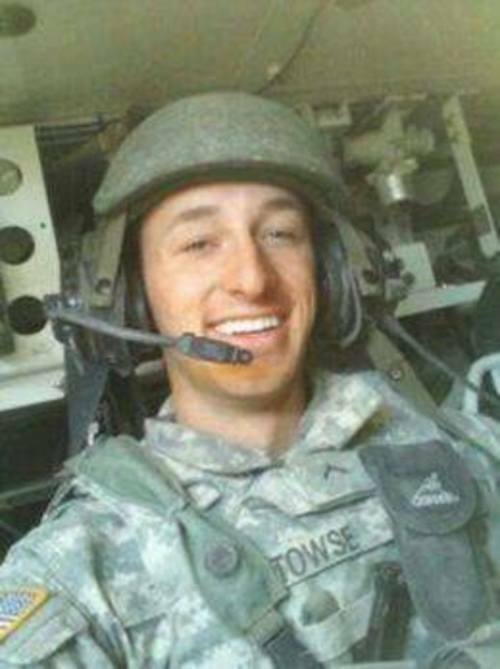 Cody Towse was killed in an explosion May 14, 2013, in Afghanistan. The 21-year-old medic is from Elk Ridge, Utah. To the kids near Kandahar, Afghanistan, Army medic Pfc. Cody Towse was known as the "Candy Doctor"  a name he earned by showering the children with countless handfuls of fruity or chocolate treats. "He loved the kids," his father, Jim Towse, said on Saturday. "His birthday was May 8, and I asked what he wanted. He told me more candy and a jar of Miracle Whip." Cody Towse, 21, died Tuesday when an improvised explosive device detonated. Military officials, who initially deemed him missing in action, were at the Elk Ridge soldier&apos;s family home to confirm the death Saturday evening, family spokesman Todd Phillips said. A Department of Defense news release says the soldiers were in Sanjaray, Afghanistan, at the time. In a late-night phone call, Cody Towse&apos;s Afghanistan commander told the family that Towse was treating a soldier injured in an explosion or attack when Towse was killed in a second explosion. "He died giving aid to another," Phillips said. Towse&apos;s remains were flown to Dover Air Force Base in Delaware before officials were able to identify him, Phillips said. The last of the four soldiers to be identified, Towse may have been closest to the blast, his father said earlier Saturday. Towse was assigned to 3rd Battalion, 41st Infantry Regiment, 1st Brigade Combat Team, 1st Armored Division from Fort Bliss. "He was my best friend. I don&apos;t know what I&apos;m going to do without him," Jim Towse said, his voice breaking. 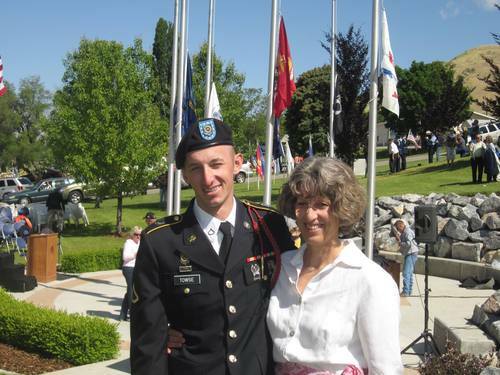 A graduate of Salem High School, the younger Towse chose the Army in 2011 over serving a mission for The Church of Jesus Christ of Latter-day Saints. Although the decision disappointed his parents some, Jim Towse said his son wanted to serve in the military in wartime because he believed he could use his skills as a certified EMT and volunteer firefighter to save lives. He did just that, earning a medic combat ribbon for saving another soldier, his father said. "I&apos;m really proud of that. It comforts me to know he went for a noble cause," Jim Towse said. "He told me, &apos;You know, Dad, if I go out in a blaze of glory, don&apos;t worry. If I can save somebody doing it, all the better.&apos; "
In his youth, Cody Towse was like a cat with nine lives, his father said. As a child of about 4, he survived a near drowning. In his teens, he fell about 19 feet from a tree at a family outing in New Mexico but was unscathed. Then at 17, Towse hit his head on the pavement after toppling off his longboard and spent about a week in a coma. "We almost lost him then," Jim Towse said. "He got saved all those times but not this time." A smart and intuitive kid who could "figure anything out," Cody Towse excelled in school and was liked by his teachers, his father said. He was a good big brother, had dozens of friends, sang in choir and dreamed of working as a paramedic on a medical helicopter after he finished his stint in the military. While his parents fretted and worried about their son&apos;s safety overseas, Cody Towse wasn&apos;t afraid. "He really wasn&apos;t. He got there right around Christmas Day and he kept telling us we didn&apos;t need to worry, there was nothing going on where he was," Jim Towse said. "And he loved what he did." Although they communicated most often through text messages, Cody Towse last spoke to his parents on Mother&apos;s Day. "You know, I&apos;ve never been very good expressing my love for my children, but when your kid goes to war, you tell them every chance you get," Jim Towse said. "I&apos;m glad I got to do that on Mother&apos;s Day." Like his father, Cody Towse didn&apos;t always say what he felt. In posts on his blog "A Taste of Whiskey," which chronicle his experiences in basic training, the young soldier confessed, "I never really tell people that I appreciate them." "There are a lot of really great people in my life that made it a whole lot better," he wrote on Dec. 9, just before heading to Afghanistan. "I just wish I&apos;d told them more often, not that I plan on dying ... that&apos;s just something I&apos;ve been thinking about lately." The post also includes a quotation from the A.A. Milne Winnie the Pooh books, which Cody Towse said can "describe every emotional latitude that ever existed." The post includes a colored drawing of Pooh sitting alongside his best friend, Christopher Robin. "If there ever comes a time we can&apos;t be together," it reads, "keep me in your heart, I&apos;ll stay there forever." Jim Towse said he didn&apos;t know about the post until someone showed it to him early Saturday. "Now it&apos;s my favorite thing," he said. Besides his father, Cody Towse is survived by his mother, Jamie, brothers Will, 20, Christian, 14, and sister Callan, 17.